The Caspian Shore Defensive Constructions is part of the Tentative list of Azerbaijan in order to qualify for inclusion in the World Heritage List. This serial nomination consists of eight elements of defense built on the narrow costal plain between the eastermost peaks of the Caucasus mountains and the Caspian sea. Four elements are on the Absheron peninsula, and can easily be reached by bus from Baku, four are in the north, about an hour fom Baku, with very limited public transportation. This narrow coastal plain is on average 11 km wide, with a narrow 2 km passage. Human trade route and bird migration use this corridor (called Besh Barmag bottleneck by ornithologists). It was on the northern border of the Sasanian empire and it successors. Derbent WHS (in Russia) and The great Wall of Gorgan TL (in Iran) are part of the same defense works. Besh narmag peak, at 382 meter above the sea, overlooks the narrowest part of the corridor. This is a famous mountain in Azerbaidjan, as a mythical and sacred moutains, regularly visited by pilgrims. There is a dirt road going in the hills (passable with regular car, take the highway exit to Siyezen, and turn left after 2 km) and reaching a small setllement with shops and picnic restarant (all closed on the day of my visit). Steps then laders climb up to the peak, where a small mosque is built in the cliff. Entrance is free, but donations box are everywhere. Near the top of the peak lies wall of a fort, from which the corridor was totally controlled. At the bottom of the peak, a barrier was also built across the corridor but I don’t believe anything remains from it. At little north of Beshnbarmag is another barrier called Gil-gilchay barrier, also built in the 5th century. In the plain, the barrier was made of red bricks, and in the mountains, it was made of towers and forts. This barrier is 120 km long. Chiraggala fort is part of this defensive barrier. Not much is advitized about this barrier, and even having researched it beforhand, I could only use my imagination to see the defense line on the mountain ridge and across the plain. To get to Chiraggala, take the road to Sizelen, and turn left on a good road just before entering the town, following Qalaalti Resort and Spa signs. The road crosses some interesting oil fields. I did not get to the castle however, as the weather was very bad that day and I ended up in a very thick fog, with a 2 meter visibility. I got scared to get lost. A bit further north, are the ruins of Shabran city. It was first built in the 6th century, but was destroyed and rebuilt several times before being abandonned in the 18th century. This site consists of a ruins of a 14th century fortress, similar to those in the Absheron peninsula. Entrance is free. To get there, take the right road at the end of the highway (the highway forks into two roads, left for Quba and right for Xacmaz), and after 5 km, turn left (there is a small sign). Bayil Tower are the remains of a castle on an island off the coast of Baku. The castle was destroyed in an earthquake in 1302, and the Caspian sea level rose and submerged the remains for several centuries. It is not possible to get on the island, but it can be seen from Baku Boulevard (the seashore walkway). Nardaran Tower is tower 30 km from Baku. The area was closed by soldiers during my visit, probably becasue of some events in the nearby mosque. 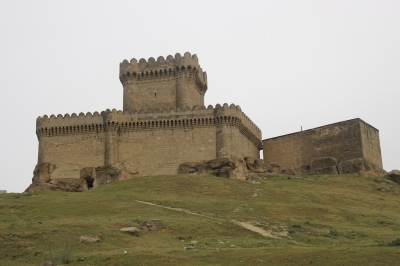 Ramana Tower (pictured) is another tower of the 12th century, this one on a rocky hills, 15 m high, overlooking surrounding villages and oild fields, 15 km from Baku. A bus leads to Ramana village. The keys to the castle are held by some neigbours, that will probably see you coming and proposing to let you in for 3 manats. It is possible to climb in the tower and on the walls. Altogether some nice places to visit. My favorites would be Ramana Tower and Besh narmag. For more information //unesco.preslib.az/en/page/usEP6403xc.